What are long-term care residences around the world doing right? That’s the question an international research team travelled across North America and Europe to find out. Led by Pat Armstrong and Donna Baines, researchers visited nursing homes in Canada, Germany, Norway, Sweden, the United Kingdom and the United States, looking for practices that make long-term care centres feel like home to their residents. Their findings won’t surprise long-term care workers. Good long-term care means building strong care relationships between residents and their care providers. Strong staffing levels, good working conditions, secure jobs, proper levels of public funding, full-service kitchens with in-house food service staff, and sensible standards – not onerous bureaucratic one-size-fits-all rules – lead to excellent care for residents. Having all services provided by in-house staff instead of contracting it out (e.g. food service, cleaning and laundry) results in better quality and more personalized care for residents. These findings are in line with a recently-published study by the Journal of Post-Acute and Long-Term Care Medicine showing that for-profit nursing homes in Ontario have 16 per cent higher death rates and 33 per cent higher hospitalization rates than non-profit facilities. For-profit homes also have higher rates of falls, incontinence, and use of restraints. The way to our hearts may not be solely through our stomachs, but good food makes a big difference to quality of care, Armstrong and Baines found. Many of the promising practices in their book revolve around food. Time and again, they found that long-term care residences where all meals are prepared, cooked and served onsite by their own staff provided much better meals, and better overall care for residents, than those who contract out food services. When food is cooked onsite, residents can smell it cooking. It stimulates their appetites and makes them look forward to meals. Directly-employed food service staff get to know individual residents’ likes and dislikes. They interact with residents at meal and snack times, creating another continuous care relationship. When food service is contracted out, strict meal times must be observed because contractors enter and leave at set times. But when in-house food service staff have food available all day long, or even 24 hours per day as it was in one residence in the book, there is no pressure for all residents to eat at exactly the same time. This takes a lot of pressure off of other care staff as well. Care relationships are built through conversations and exchanges during and in between routine care tasks. In homes with flexible meal times, personal support workers don’t have to rush through care routines to get residents to the table by a set time. That leaves time for relationship and trust-building. In a care home in Germany, residents were even encouraged to help with the food preparation as they were able, with food service and personal care staff nearby to assist when needed. This created a social atmosphere between residents and care staff, and fostered residents’ independence. In a residence where food preparation and service is contracted out to private companies, this kind of interaction doesn’t have a chance to happen. Decreasing staffing levels lead to lower quality care, which then leads to bureaucratic rules requiring excessive documentation and the regulation of what should be common sense. Personal support workers in Ontario often have to do well over an hour of routine charting every day – time they could spend assisting and interacting with residents. In contrast to this, one Manitoba nursing home visited by the research team “charts by exception” – in other words, they only document occurrences that are out of the ordinary or things they specifically need to track. This gives them time to build care relationships with residents. In the nursing homes visited in Germany and Sweden, there was a greater focus on putting “more life into days than extending the days of life.” A certain level of risk is accepted in exchange for quality of life. Residents engage in activities that encourage independence, like food preparation using knives, or walking about instead of being pushed in wheelchairs. Residents with dementia who wander are watched and redirected by staff instead of being restrained or locked in. Staff have time to sit and talk with residents, meeting their socialization needs, not just their personal care needs. But these practices require a high ratio of staff to residents. The German nursing home above had staff to resident ratios as high as 1:3. In Ontario, there are no regulations for minimum staffing levels to ensure that other regulations are met, such as the provision of toileting assistance, repositioning, and other types of assistance. Some Ontario PSWs are responsible for up to 42 residents at a time. This is well below the four hours of direct care per day that the Ontario Association of Non-Profit Homes and Services for Seniors recommends. According to Armstrong and Baines, high quality long-term care could be the norm instead of the exception in Canada, if we had the desire and political will to make it happen. It will require a culture shift – a move from thinking of care for seniors in terms of a business model, to thinking about what long-term care residents need in order to live fulfilling, dignified lives. Relationship-building cannot be legislated. But we can create the conditions under which care relationships can thrive by setting minimum staff ratios and care hours per resident, creating better working conditions for staff, committing to strong public funding and removing the profit motive from long-term care. 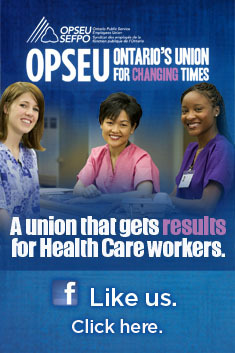 This entry was posted in CCAC, Health System, Home Care, Long Term Care, Ontario Health Coalition. Bookmark the permalink. Well said for all government institutions. thumbs down on for profit services.. The OPSEU, diablogue shares key international practices to advance “LTC” aka “residential care housing and caring for the elderly and some younger people with serious disabilities,” with an emphasis on a holistic approach that incorporates “the needs of residents, families, workers and managers.” This report was organized/edited by Donna Baines and Pat Armstrong via the Canadian Centre for Policy Alternatives (CCPA).